Thiel-a-Vision » 31 Monsters #31: Happy, Happy Halloween! Home > Movies	> 31 Monsters #31: Happy, Happy Halloween! 31 Monsters #31: Happy, Happy Halloween! All right, I’ll admit that for a series named “31 Monsters,” this last entry is a bit of a cheat. Even more so than Dr. Sheila Frankenstein. There’s no actual monster here, but I honestly couldn’t think of a better way to wish you a Happy Halloween than the following. In 1982, the makers of the Halloween films had a couple of problems. One was that their star character–slasher prototype Michael Myers–had met what appeared to have been a very definite and explosive death at the end of Halloween II. The other was that there wasn’t much more to do with the concept. I mean, really, could you imagine making another seven movies about a mute in a Captain Kirk mask? Carpenter hired British screenwriter Nigel Kneale, best known for his sci-fi TV serials featuring scientific investigator Prof. Quatermass, to pen Halloween III: Season of the Witch. And it has to be said that Kneale came up with something about as far removed from a knife-wielding William Shatner as possible. Instead, horror fans were met by Dan O’Herlihy as Irish-born maskmaker Conal Cochran, whose “Silver Shamrock Novelties” company had saturated the airwaves with a relentless commercial campaign for his line of Halloween masks. The masks themselves–a witch, skeleton and pumpkin–were standard enough, but the gimmick was the “big giveaway” to be held live on Halloween Eve. Cochran turned out to be a warlock attempting to return the holiday to its alleged roots. His factory melded science and sorcery, with each mask sporting a microchip embedded with a fragment of stone from a stolen Stonehenge megalith. The final Silver Shamrock commercial was encoded with a signal that would activate the microchips and cause the head of anyone wearing one of the masks to erupt in a mass of bugs and snakes. That’s right, bugs and snakes. 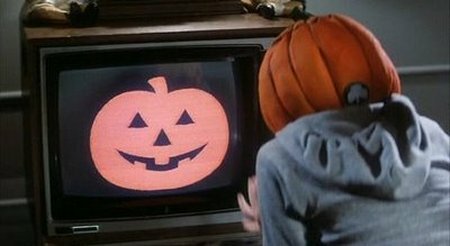 Now, goodness knows that Halloween III is by no means a good film–Kneale had his name taken off the final product–but I’ll give them credit for trying something different, even if it plays like a particularly nasty episode of Scooby-Doo. However, the main reason that anyone remembers it at all is the damnable Silver Shamrock jingle which plays repeatedly throughout the film. Seriously, it’s probably been at least two decades since I saw it, and that thing is still stuck in my head. I wanted to embed the Silver Shamrock commercial, but it turned out that for all the times it was seen, it never played all the way through on-screen. And YouTube didn’t give me what I wanted. So here is my very own Silver Shamrock montage, created just for you. This wraps up my look at ghoulies, ghosties and things that go stomp in the night. It was fun (for me), but I have to admit that I’ll never again commit myself to 31 consecutive daily blog posts, especially when I have a vacation scheduled in the middle of the month!